Comrade Motopu provides an overview of Phil Neel’s book and attempts to place it in the ongoing debates over the centrality of labor movements vs. surplus populations and riots vs. strikes. 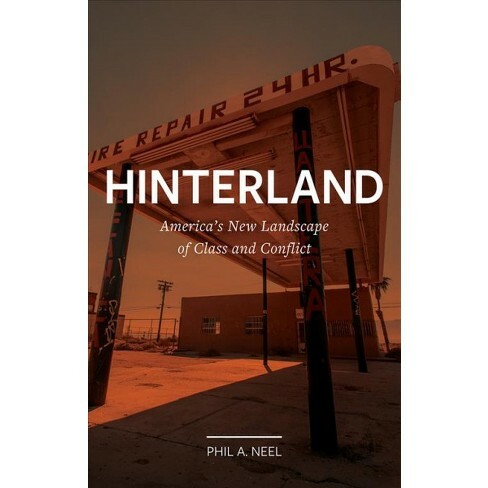 Neel, Phil A. Hinterland: America’s New Landscape of Class and Conflict. Edited by Paul Mattick. London: Reaktion Books. It’s commonly held that cities like Tokyo and New York drive the global economy. Those thriving cities feature “post-industrial" economies filled with high tech “creatives” and professionals in the FIRE industries (Finance, Insurance, and Real Estate). Cities produced 90 percent of total economic output in the US in 2011 (10). Yet these global hubs of value production could not exist without actual sites of physical production, resource extraction, logistics hubs and distribution corridors, and the working people inhabiting them. They are all increasingly located outside the urban centers in what Phil A. Neel calls “hinterland.” Neel describes the changing spatial terrain of capital and the ways it shapes class formation. His personal work experiences and on-the-ground observations from various hinterlands make for an engaging read. The hinterland is distant from the thriving cities of the (alleged) ‘post-industrial’ economy. The near and far hinterlands are places where the global proletariat has become separated from the means of production, with fewer people in skilled factory jobs and more in service and logistics work, or often in shadow economies consisting of work of varying legality. While the near hinterland is more suburban, it’s not the suburbia of the old middle class dream. In Europe it is often where immigrant workers live, working either in large logistics hubs or commuting to the urban core to work. In Africa and Latin America the near hinterland is often like the typical slum cities of the US. In the US, there has been a “demographic inversion” in many areas, which has seen “the transformation of old postwar suburbs into the primary settlement zones for new immigrants and for those leaving expensive urban cores.” This in turn generates new ghettos which bring new forms of resistance, like the 2014 rioting in suburban Ferguson, Missouri (18-19). Neel sees the near hinterland as a likely center of coming social upheavals. The far hinterland is more rural, but also “includes large urban zones of collapse.” These include rust belt cities where so many buildings have been torn down, they start to resemble rural areas (18). There the work is often in “disaster industries” like fire control, but also the extractive industries and processing raw materials. In the far hinterland you are likely to find informal economies including meth or opioid production and distribution. Here, “Patriots” refers to groups like the Oath Keepers and Three Percenters. “Third Positionists” refers to groups or individuals with politics that combine the rhetoric of Left and Right, claiming to be “beyond” either, but ending up with hard Right reactionary politics. Trump’s base in these exurbs was important to his election, but workers in the hinterland also played a role by not voting (9). The hinterland is no longer a periphery as much as a sprawling extension of cities and production hubs in the global economy. It is a “distributed core, distinct from the array of services and FIRE industries of the central city but more integral to the ‘immediate process of production.’” Hinterlands are often industrial regions with factory farms, logistics complexes, extractive industries and power generation (17). However, in the hinterland, the proletariat “returns to something more akin to its original condition, defined more by its dispossession than its privileged access to the gears of the world as an industrial workforce” (145). The geographic displacement and declining class power of the proletariat are occurring in what Neel calls the “long crisis.” This is not just the end of the post-war boom of 1945-1973. In an interview for the Brooklyn Rail, he explained that the long crisis is more a normal function of the capitalist economy, suggesting that the post-war boom, and attending labor-capital compacts, were the anomaly not the stabilization of normal capitalism. There is a tendency for the economy to produce surplus labor along with surplus capital, so people are out of work as elites can’t find profitable investments for their money. Neel cites the historian Aaron Benanav’s outline of trends for high-income countries, where GDP per capita growth rates have been falling since the 1960s, when the average rate was 4.3 percent annually. In the 1970s it was 2.8 percent; the 1980s 2.3 percent; 1990s 1.8 percent, down to 1.2 percent in the 2000s. Meanwhile, the number of US households below the world bank poverty line “more than doubled since the mid 1990s, reaching 1.5 million households in 2011” Recessions get deeper, and “jobless recoveries,” where new jobs don’t restore the old growth rates, make it appear that there will be no return to an age of strong capitalist growth (16). The corresponding deindustrialization of the long crisis occurs within and outside the United States. Regions that fall from industrial centers into “rust belts” are a global phenomenon. Waves of deindustrialization hit China at the turn of the century, and following the 2008 global recession. Hollowed out cities can become inner city slums, or in some cases hubs for “creatives” and financiers. Simultaneously, rural regions might be abandoned and fall to wasteland. Alternatively, they might be repurposed as primary production sites, with oil fields, mines, farms, or become sites for energy production. Other options include redesignation as recreational areas or as prison or military complexes (17). A global crisis is restructuring the geography of production, and with it class, inside and across international borders. Hinterlands proliferate. Neel and others look closely at the changes in production and class composition that make class struggle in the vein of the traditional workers’ movements less likely in their view. The roots of these questions over class composition and the very idea of the centrality of the working class as revolutionary subject go back to at least the 1917 Russian Revolution, in which corresponding revolutions in Germany, Italy and elsewhere failed and were crushed by fascism and authoritarian regimes (and many argue the Bolsheviks brought the defeat of the proletarian revolution in Russia). If the working class was not to be the central subject of the revolution, many wondered if substitutes could emerge in national liberation, peasant, student, or other movements. Some argued that the old Leninist and anarcho-syndicalist parties had only tried to capture existing production and manage it in a more socialist way, whereas the changing terrain of capitalism now called for “communization.” This means that communism is not achieved “after the revolution” or delivered in stages. It will be the process and form of the revolution itself. As Gilles Dauve wrote, it will be “a violent decisive break through the entire social, political, and ideological structure” (Dauve, 33). Some communization theorists have focused on the way that workers have been more and more excluded from work, which represents a break with the past in their view. Workers’ struggles of the past had focused on seizing the means of production, but the present stage of capitalism, as described in the journal Endnotes saw “a working class in transition, a working class tending to become a class excluded from work.” It is the debates over the precarity of work, and how it limits the possibility of labor struggles which largely frame the question of tactics for the working class today. Silver describes recurring cycles in which there is “oscillation between historical phases characterized by a move toward the de-commodification of labor and the establishment of new social compacts and phases characterized by the re-commodification of labor and the breaking of old social compacts.” Commodification of labor here refers to when market logic, as imposed by capitalists, is the primary determinant of wages and working conditions. As workers organize in the face of capitalist exploitation, they gain the power to demand higher wages and better conditions, adding their own human estimation to the calculus of the value of their labor and the meaning of their work. Capitalists can deal with this in various ways. One method is for capital to flee to another labor market seeking cheaper, less organized labor. Silver calls this a “spatial fix.” The agreements forced by workers on capitalists are the “social compacts” that can be broken, in this example, once capital flees an area, leaving the workers without the possibility to demand more. However, the problem for the capitalists is that the cycle starts anew, with the workers in the new region going through similar organizing and strengthening processes, eventually being able to make more demands, meaning the “de-commodification” of labor. From the workers’ perspective, it’s a problem that their power is so often intertwined with capitalist investment. Silver characterizes the two basic types of resistance capitalists meet as “Polanyi-type” and “Marx-type.” The Polanyi-type consists of “the backlash resistances to the spread of a global self-regulating market, particularly by working classes that are being unmade by global economic transformations as well as by those workers who had benefited from established social compacts that are being abandoned from above.” So the Polanyi-type movements resist the changes brought by capital flight, outsourcing, and the death of industries in regions, or they seek to win back lost gains. The Marx-type are “the struggles of newly emerging working classes that are successively made and strengthened as an unintended outcome of the development of historical capitalism, even as old working classes are being unmade” (Silver, 37). These occur at the birthplaces of industries, also where newly proletarianized workers are brought into production, and generally “where Fordist mass production expanded rapidly” (Silver, 41). The World Labor Group Database charted out the movement of labor unrest that followed the auto industry across the globe: “A series of geographical shifts over time in the epicenter of autoworker militancy are visible - from North America in the 1930s and 1940s to northwestern (and then southern) Europe in the 1960s and 1970s to a group of rapidly industrializing countries in the 1980s and 1990s” the latter being Argentina, Brazil, South Africa, South Korea, and Mexico (Silver, 42-45). This moving resistance and shifting locus of worker militancy is very different from a simpler “race to the bottom” in which workers in every area are pitted against one another to the steady decline of all. ...Forces of Labour sees in this restructuring merely a return to a situation of class struggle where workers have to contend with a terrain in which they have less positional bargaining power. Thus the apparent eclipse of class conflict in the advanced economies merely masks a situation in which workers are coming to terms with the altered parameters of their situation before the irreconcilable conflict between capital and labour becomes overt once more. Whereas Silver describes the recurrence of these types of labor struggles centered on (moving or changing) points of production, Neel’s milieu broadens the class subject beyond “labor” into the “surplus populations” of the type found in hinterlands. What has risen most for decades is not circulation in the limited sense of finance, as Clover emphasizes, but the many private-sector “services” that capital has increasingly captured, of which FIRE (finance/insurance/real estate) accounts for about a third in value added. The other services representing two-thirds of value added, and over 90 percent of private-sector service employees— such as health care, food service, transportation, communications, travel, accommodations, entertainment, waste management, utilities, etc. — scarcely exist in Clover’s account of a hollowed-out capitalism bifurcated between goods production and finance. As more proletarians fall into the status of surplus laborers (or a reserve army of labor), the appeal of far Right movements has grown. Many recent books have examined the class base for Trump’s 2016 victory and the recent upticks in white supremacy, xenophobia, virulent nationalism and the popularity of far right forces whose ideology would seem to oppose the interests of those supporting them. Neel examines various elements of the far right. The “alt-Right” gets more media coverage than their significance warrants. The older generation of militia groups in the US were far more committed to white supremacy than recent recruits. Veterans of Bush’s wars, returning to economic depression and slashed budgets have been more open to far right ideologues (24). Among working class support for the far Right, a fragmented and defeated proletariat contains more self-employed “petty proprietors” who tend to see themselves sharing the interests of the ruling class who often promote US style Right-Libertarianism and a “pick yourself up by the bootstraps” ideology. It is the “Patriot groups,” he argues, that present the greatest threat to the working class. They are where the broader far Right culture “takes flesh.” While the institutionalization of the Patriot Movement’s goals, in ideologues like Steve Bannon, may actually lessen militancy as they engage in mainstream political activity, it is the original Patriot organizations like the Oath Keepers and the Three Percenters who can appeal to working class people in the hinterland. They have tens of thousands of followers on social media and “at least a few thousand actual members” (27). Both groups are preparing for the coming Second American Revolution and attendant social collapse by setting up basic services which are “parallel government structures.” These “self-reliance initiatives” include disaster preparedness trainings, gun-safety classes, neighborhood watch programs, but also activities like building playgrounds, painting houses, and providing free medical care (30). Neel describes “the oath” as unifying politically diverse movements around “a shared principle of action” (52). Because the Patriot Movement is controlled by an engaged minority with clear functions “which can gain popular support via its ability to outcompete the state and other opponents in an environment of economic collapse,” it can act without clarifying an ideological or political set of demands. Such demands can be exclusionary litmus tests when Left groups prioritize them over group action. Rather than unity around political programs, ad hoc movements may arise composed of groups that are forced to “take sides in relation to political upheavals” (53). Why do “oaths” in the hinterland tend toward far Right ideology? In part, it has to do with the class position of the leadership. It is often the ranch and mine owners, more broadly the local boss class, who are heavily involved in these Patriot activities. They organize with an “inside-outside strategy” (31). The inside aspect is entrance into local government through the Republican Party. The outside one takes place mostly in hinterland regions where timber, mining, and ranching work has dried up. In some cases the Patriot politicians seek to undercut Federal aid programs so they can fill the holes in services with their own Patriot run versions. These far right forces can out-organize liberals in the hinterland. The liberal solution is often to raise taxes on the rich to fund local infrastructure. The problem is that the local hinterland timber, mining and ranching have often collapsed, and with them, the major sources of tax revenue to fund social infrastructure in these crisis regions. For this reason, local workers and smaller land holders can be persuaded that it is in their own best interest to throw their political and electoral support to the business class. Their hope is that if these local industrial bosses can make a come back, the golden age of the “real economy” (not FIRE or federal aid) will return too, and the quality of life with it ( 37). The question of why working class people ever support strongly anti-labor politicians and the Republican Party at all (even if they are not those politicians’ “base”) has been a hot topic lately. One obvious factor is the Democratic Party’s abandonment of labor: “the Democratic Party’s long-standing treatment of labor as just another ‘special interest’ has set the stage for endless disappointment” (Early, Save Our Unions, 91). Political Scientist Katherine J. Cramer met with 40 different groups of mostly working class people in Wisconsin over a five year period, to listen to their political views (Cramer, 5). Her research became the book The Politics of Resentment: Rural Consciousness in Wisconsin and the Rise of Scott Walker. Most of the interviewees live outside the major urban areas of Madison and Milwaukee. Sitting with them at their regular meet up spots, gas stations, coffee shops, etc., she begins to understand their “rural consciousness.” Three recurring views emerge: There is a feeling that the urban areas hold more political power than the rural; that urban people don’t value hard work and that they expect free handouts from the government; and the perception that resource distribution favors the urban areas, with taxes being focused on schools, infrastructure, and other projects in urban areas more than rural ones. Cramer clarifies that it is mostly untrue that Wisconsin’s rural areas receive less funding per capita than urban ones and that rural Wisconsinites on average actually pay less state and federal taxes than their urban counterparts. However, Rural residents “also tend to experience greater levels of poverty, lower wages, and modestly higher rates of unemployment” (Cramer, 93). The difference in how much government programs achieve in rural areas is often down to the way some services “simply cost less in cities because of economies of scale.” Even though the perception of the urban areas getting special treatment is not technically correct, it still becomes political fodder for reactionary forces who can manipulate public opinion in favor of extremely conservative “solutions.” Public workers, union members, teachers, and people on welfare are all seen as leeches, getting too many benefits, too much pay, or too much “free stuff,” at the expense of decent hard working rural folk. Even when the interviewees supported social safety nets or government aid, they believed it would never adequately reach their rural areas. These are some of the reasons Scott Walker enjoyed popular support when he introduced “Act 10” in February, 2011. The bill passed into law in June of the same year, despite large union protests at the state capital. It gutted pensions, lowered salaries, and limited collective bargaining for most public employees to wages only. The bill provided the momentum for Walker to push through legislation in 2015 that made Wisconsin the 25th “Right-To-Work” state. Much of the resentment targeted at public workers, academics, and other urbanites had to do with the perception that they don’t really “do anything.” Some of Cramer’s interviewees shared stories of egghead types from the University of Wisconsin-Madison and the Department of Natural Resources carrying out elaborately useless studies on trees or mice that just end up interfering with their hunting and fishing, proving to them how out of touch public workers and city slickers are (Cramer, 124-125). Regarding government employees, interviewee “Harold” believed that “90 percent of ’em, up in that state office building or wherever the hell they are working, if they lost the job they got, they would lay down in the gutter outside here and die, since they don’t know how to do anything else. There ain’t very many of ’em that sweat. . . . I still know how to work. I’m eighty-two years old and I’m driving a semi! (Cramer, 188). This correlates to what Neel describes when those in the hinterland throw support to far Right groups in the hopes that the “real economy” will be reborn, defeating the liberal elites who are completely out of touch with the situation on the ground. Barbara Ehrenreich, in her 1989 book Fear of Falling: The Inner Life of the Middle Class described the way the “New Right” developed a cross-class strategy based on an alliance between the ruling class and blue collar workers, against the then expanding, largely liberal, “Professional Managerial Class” and the poor. She cites the work of New Right strategist William A. Rusher, who wrote in his 1975 book The Making of the New Majority Party that there was no longer a divide in the U.S. between haves and have nots. Instead, the real divide was between “producers” and “nonproducers.” Ehrenreich describes his view that the producers are “the blue-collar people who make things, plus the capitalists who generously and thoughtfully pay them to do so. Hence there is an obvious affinity between the very wealthy and the working class. Together they produce. And together they support everyone else--the swelling population of nonproducers.” Today, mining and ranching bosses in the Southwest use this same notion of “those who produce” vs. coastal elites, bankers, and welfare recipients as “nonproducers” to create a unifying identity to rally to their politics. In some cases, the hinterland’s dependence on federal funding for jobs, though resented, may outweigh this loyalty to the local “real economy” leaders, leading to their defeat. This was true in the case of the Malheur Wildlife Refuge occupation of 2016 in Burns, Oregon. Government workers make up 37.3% of the population there (40). The class basis of the far right positions rests far more on these “land-politics” than white supremacy. The goal is returning local land management “to revive long-dead local timber, mining, and ranching industries. At the same time, they argue that the devolution of federal power to states and counties will allow local communities to manage their own affairs” (38). The militant minority can have outsized power on the Left as well. This is where Neel introduces the concept of the “ultra.” Many readers know that “ultra-Left” is a pejorative used by some sectarian Leftists to dismiss groups and individuals who are seen to be lacking materialist analysis and a focus on class struggle or lacking the expected adherence to party-lines or union leadership. The ultra is a related category as they are outside the normal political and institutional parameters of orthodox Leftist subjects (actors). To contemplate the possible importance of actors outside the stereotypes of the traditional workers’ movements, one has to consider the current climate in which the largest group showing in the 2016 presidential election was not Republican or Democrat, but those who did not vote (42% of the electorate). As far as unionization goes, 89.5% of US workers are not in a union. In 2016 10.5% of the total workforce was unionized with a mere 6.4% of private sector workers and 37.2% of public workers in unions. Any strategies for class struggle will by necessity have to address those workers not invested in electoral politics or not organized in trade unions. Neel starts with a description of the “Ultras” (upper case) based in football clubs who participated in the various “Squares Movements” from Tahrir (Cairo, Egypt) to Spain and Greece where occupying public squares was key. They had fighting experience and sometimes vaguely Left-wing politics and used violence to escalate protest into unrest and riots, and even insurrections. Before moving on to the lower case ultras, it may be useful to recall an earlier exemplar of successful militant minority led class-struggle in the December, 1936 occupation of General Motors Fisher Body Plants No. 1 and 2 in Flint, Michigan. In that era the workers were far more connected to the means of production than the present Neel describes in Hinterland, hence their tactic of occupying the auto plant with a “sit-down strike” to prevent scabs from taking over production. But as Beverly Silver notes in Forces of Labor, it was also a period of high unemployment and weak labor organization. Despite those weaknesses, a militant minority surprised the bosses by halting the assembly line and sitting down at their machines. This motivated most of the workers to support the union strike based on the actions of that militant minority. When the working class develops a pragmatic understanding of the terrain of capital it becomes possible to catch the capitalists off guard and disrupt their production. In the 1930s, auto-workers understood the vulnerability of the auto plants to the relative “work-place bargaining power” of the Flint workers: “the ability of the workers to exploit their position within the complex division of labor characteristic of mass production.” Because the Fisher Body plants “produced the bulk of Chevrolet’s engines,” the Flint sit-downs caused a ripple effect that went far beyond one factory as the “corporation's rate of output decreased from 50,000 cars per month in December to only 125 for the first week of February” (Silver, 47). Neel’s ultras (lower case) similarly use their position and understanding to attack capitalism, despite their lack of work-place bargaining power. They are a vanguard, but not in the Leninist sense of bringing class consciousness to the workers from outside. Neel defines the ultras as “small grouplets enmeshed in larger struggles who wield some sort of ‘latent military strength,’ unified by something other than basic political agreement, and who operate to advance and defend the potentials opened by recent unrest.” These ultras act “on behalf of and alongside” the mass movement for maximal demands. Neel stresses their difference from the self-serving interventions by “warlords, gangsters, or religious fundamentalists,” although the potential for ultras to turn rightward if the revolutionary forces fail is an unfortunate possibility (152). Political ultras and far Right partisans both see power in pragmatic terms and place action ahead of analysis. Both act in the belief that “political support follows strength, not vice versa. Neither have programs, but both adhere to the oath as an organizing principle” (155). Here, Neel’s concept of “the oath” bridges the various fragmentations of an atomized proletariat, focussing on action to take power, without the need of a well defined political program. There are, however, fundamental differences between the oaths of the far Right and those of the ultras. The Right’s oath is based in identity, on nationalism, sometimes racial concepts, but always on an exclusive community. It therefore needs to scapegoat and exclude other communities to define their own. These can be urban city dwellers and or blacks who are perceived as refusing to work while they leech off government programs that hinterland dwellers believe they do not have access to themselves. They can be immigrants who get job training or housing aid, or who are seen to take jobs that should have gone to “native” workers. This is an “oath of blood” as Neel calls it. The ultra’s oath is very different. It is inclusive, not based in an exclusive community or nationality, and capable of uniting working class people, “of at least temporarily cutting across an other-wise-unbridgeable atomization,” regardless of differing experiences of class (154). The examples given here are Juggalos uniting with indebted college students in the US Occupy movement, and football hooligans and slum dwellers in Egypt siding together against the state. He calls it an “oath of water,” one that “seems to seek nothing but further erosion, the growth of the flood” (155). The oath of blood tends toward authoritarianism, gang activity, and other exclusionary forms, while the oath of water is partisan on behalf of the mass in the uprising (156). Neel was in Ferguson between the time of the riots protesting Brown’s murder, and the later protests following the failure to prosecute Wilson. He describes Ferguson as a model for both a system of government funding through police-state repression in the face of collapsed tax bases in many U.S. cities, and the coming hinterland riots of the future. He explains that Ferguson is somewhat typical of U.S. cities in decline, with a heyday in the 1950s and ‘60s, consisting of population booms followed by a process of deindustrialization that began in the late 1970s. By 2018, the city’s population had fallen to about 21,000 residents from the 1970 high of nearly 30,000. Ferguson’s racial make up “flipped” as poverty rose: the 1990 Census showed 73.8% white and 25.1% black. In 2010 it was 29.3% white and 67.4% black. Unemployment jumped from 5 to 13% from 2000 to 2012, as incomes dropped. The dwindling population and falling property values led to a typical hinterland crisis of tax revenue generation to pay for basic services. To bring in needed revenue, “extra-tax fees” were gathered by police and enforced by the local courts. “Out of a population of roughly 21,000, over 16,000 Ferguson residents had arrest warrants issued” (132). The kind of police state this creates was reflected in the second Ferguson DOJ report that found rampant police abuse and as the New York Times reported, that “Ferguson police routinely violate rights of blacks.” The warrants were the foundation of a “complex racket” designed to bilk the poor to fund the government and by 2013 “fines, court fees, and other such extortions accounted for some 20 percent of the city’s budget” (133). The Ferguson funding model has gone national following the 2008 financial melt-down. Legal surveillance, harassment, and punishment grows according to a municipality’s financial need. It’s not only city and state police, courts, and the National Guard when needed that maintain law and order in the hinterland. “Race leaders,” church groups, and NGOs also have a role. Ferguson lacked local black leadership so it had to be shipped in. Black highway patrolman Ronald Johnson was made temporary police commander and photos of him hugging protesters appeared in the national media. The “elderly civil rights leaders and their young crop of Americorp-bred, Ivy-League-educated, middle-class-poc apprentices” were not accepted as a legitimate local black leadership class. Neither Jesse Jackson, nor Al Sharpton were able to reign in the uprisings. After the gentle approach failed the National Guard again appeared (141). Ferguson also represents a new suburban terrain for riots in the U.S., different from the more familiar urban riot. It is a diffuse and decentralized layout where rioters were able to “move between street, forest, and fenced-in yard” mostly free from surveillance. With such freedom of movement, it became more difficult for police to control or capture rioters, so instead they often focused on protecting corporate property, and big box chain stores. In urban riots, controlling public transportation can limit rioters’ movements, but in Ferguson there is little dependence on it because people use cars. People were able to target police with Molotov cocktails and even guns, and escape into surrounding greenery and cover of night (given also the fact that this setting is nowhere near as well lit as the urban landscape). The very layout of the hinterland has ushered in a new type of riot that law enforcement has yet to overcome: “Ferguson, then, is the unambiguous entry of the United States into a global era of riots.” (142-144). Neel observes the shifting tactics that accompany the changing geography and terrain of the class struggle. He has done so as a participant in many of these uprisings. He sees a role for the “ultras,” as a vanguard, not in that they control movements ideologically as much as “they represent the forefront of mutation and adaptation in the evolutionary meat grinder of global struggles” (169). The ripening situation in the near hinterland, where social decline creates resentment and elites have not adapted to new techniques of the riot will likely see increasing levels of unrest in the near future. After participating in the Occupy Movement in 2011 Neel came away critical. But he still had a lot of respect for many of its aspects, including providing basic communal services, from medical to childcare, shelter, cooking for large groups, and cleaning the encampments. He saw some of the limits of occupying and blockading tactics. Seizing parks and streets doesn’t penetrate financial command centers of the urban core. Blocked freeways often can’t be held for long, and commodities moving along them can be rerouted. Even if corporate board rooms are taken, capitalists can meet elsewhere without disruption. Neel quotes the Invisible Committee’s description of insurgents entering the corridors of power only to discover empty places, “that is, empty of power... as in Ukraine, in Libya or in Wisconsin “(161). Given the fragmented and diffuse nature of capitalist production, it is no longer realistic to expect to shut it down by occupying urban cores only, where command functions and capital in the form of money can be moved virtually. Much production is located in far removed hinterlands, and in logistics clusters throughout the supply chain. With more workers in service and logistics, the geography of disrupting production and distribution must be mapped anew (160-163). Neel’s commitment to communist class-politics leads him to express a strong dislike for “identitarian politics on offer in most activist circles, which share their political basis with the far right.” While Neel rightly warns of the pitfalls of class collaborationist representation from, for example, a “black leadership” class during the Ferguson riots, it has become more apparent that many on the social democratic Left have a shallow critique of “identitarianism.” It will also be necessary to avoid the alternative trap of “class representation” which Mike Harman defines as “a rejection of revolutionary class struggle as such, in favour of color-blind class representation by union leadership and socialist politicians.” Neel’s milieu does critique the concept of belonging to “The Left” which is understandable, given the Left tradition of turning on the working class when beneficial to its own institutions, political parties, or union bureaucrats keeping a “place at the table” with the capitalists. In the current era of diminished union density, of “labor peace” and pro-capitalist reformist strategy on the Left, there is a need to understand the ways class struggle emerges outside of the institutions of the historical workers’ movement. It’s also important to understand the tactics of the bourgeois forces using populist rhetoric to cleave the working class and bind a part of it to their capitalist, and when necessary, fascist program. No one in these debates, between those seeing recurring cycles of labor resistance and those positing a break with the era of historical workers’ movements, would argue against the centrality of class struggle toward communism. The differences come in the questions of class formation and composition, and tactics. Both the labor focused and the surplus population focused groups see the broken compacts between capital and labor as pointing toward new waves of working class unrest, although they debate whether the riot or the strike will be the prevalent and most effective tool to confront capitalism. Although I believe the strike will continue to be the main weapon for the working class, it doesn’t necessarily follow that the dying labor movement will be the source of future strike waves. If sectoral strikes do expand into General Strikes, it will inevitably include the vast majority of non-union members. Therefore the work being done by Neel and others is worth engaging with regarding the changing points of entry into the class struggle and its ideological and tactical aspects. Good read. Pulls a lot of threads together. Can't emphasize enough how critical it is to be accurate about geography and class composition.